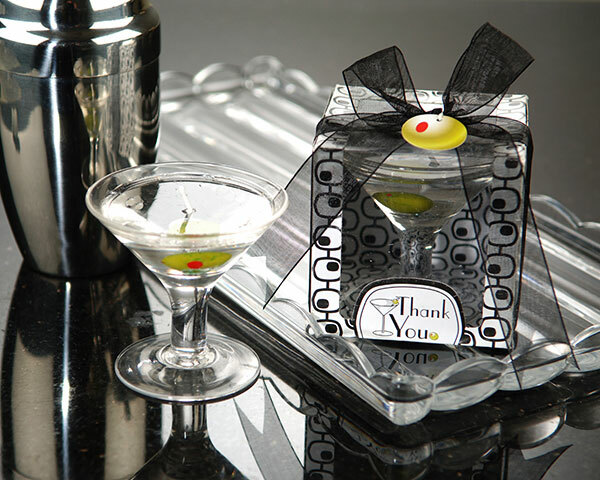 Martini Glass Gel Candle - EconoBride - Budget friendly wedding favors. Shaken, stirred and a fabulous little favor. This cool candle warms up any occasion � reception, rehearsal, shower, or even a special cocktail party. Clear gel burns brightly in this miniature martini glass made of real glass. One little "olive" bobs delicately in the gel, adding a realistic touch to this tiny cocktail. The only thing more impressive than the candle itself is the gorgeous little chic gift box it arrives in! A transparent window showcases the candle and the black and white olive print shimmies over every inch of the box (even inside!) There's even a "Thank You" graphic printed right on this showcase box. A sheer black ribbon, tied in a bow with included sweet little olive tag! . Candle measures 2 �� x 2 �� and box measures 2 3/4� x 2 3/4�. Cheers, darling! Due to the summer heat, April-September we will only ship this favor on Monday, Tuesday and Wednesday, and recommend expedited shipping to circumvent the risk of melting.